In Events, Guides, Southeast Michigan. In the middle of Orchard Lake, a 35-acre body of land towers 31 feet above the water. Enveloped in a thick covering of trees, Apple Island is a modern-day mystery to countless boaters, pedestrians, and commuters who drive by each day. For one weekend each year, however, the secrecy subsides as this landmark opens to the general public, inviting us to take an up-close look at what lies within the island’s jungle-like exterior. Having very little knowledge of the West Bloomfield/Orchard Lake area, I was thrilled for an opportunity to experience the Greater West Bloomfield Historical Society’s (GWBHS) Apple Island Tour weekend. Taking place during the third weekend each May, these tours are designed to highlight Apple Island’s history while raising awareness about the GWBHS, Orchard Lake Museum, and local research efforts. Catching a shuttle from the Orchard Lake Museum to Orchard Lake, I hopped on a boat with several other tourists and set off toward Apple Island. A light fog rolled in, and as our boat neared the shore, I couldn’t help but think of how much the island reminded me of Jurassic Park. Fortunately, Apple Island is not known for cultivating a community of live dinosaurs, so I got off the boat with few worries and hiked into the woods for a better look at what lay inside. Believed to have formed from a glacier movement thousands of years ago, Apple Island has seen its fair share of inhabitants. Our walking tour revealed the history of prominent residents such as Scottish businessman, John Coats, who in 1856 sold the island to Colin Campbell (a Scottish merchant) and his wife, Caroline. Willis Ward, a friend of the Campbells, later moved to the island and took over to build a new house and underground generator room that provided power for the island. Today, building remnants are scattered across the island, all reduced to their foundations by fire or decay. 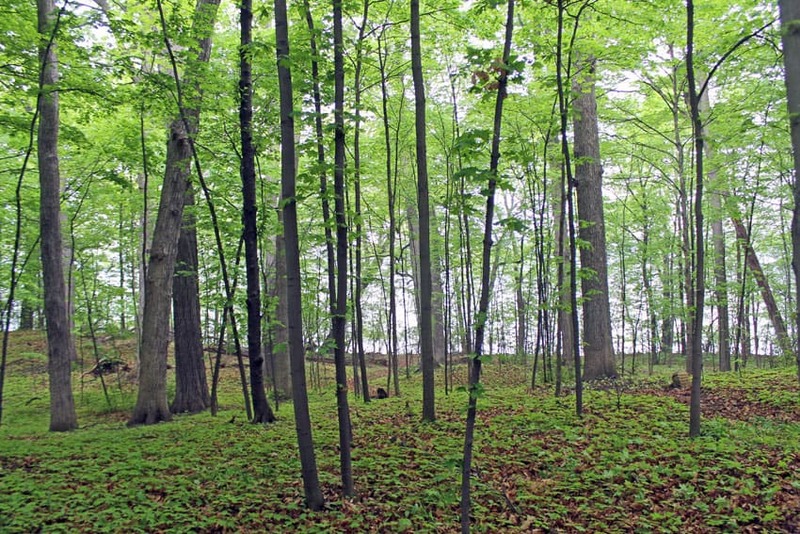 Century-old maples (many of which are tapped regularly for maple syrup) and younger ground coverings take the place of what were once sun-drenched gardens, and an open view of the water has disappeared behind tree trunks and leaves. 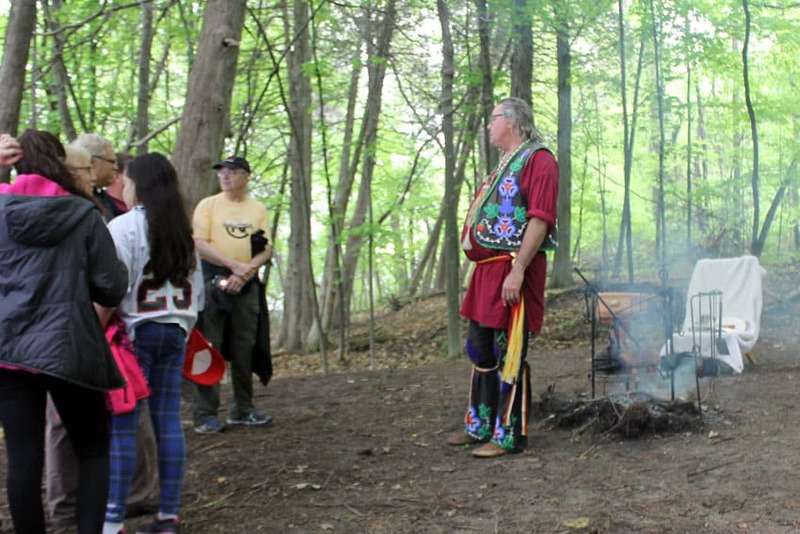 After winding our way through the woods, our docent introduced us to two present-day Native Americans, who taught us about their culture and what life on Apple Island looked like long before families like the Coats, Campbells, and Wards arrived. Dressed in traditional Native American clothing, the presenters delivered examples of “sacred stories,” displayed handmade items such as intricate bead-work and wood carvings, and referenced nature-centered spiritual beliefs. One presenter, who was camping on the island for the weekend, demonstrated his respect for the land by explaining how he always leaves campsites in the same condition he finds them (no fire ash, garbage, or other evidence left behind). Stopping for a few minutes to admire the sounds of birds and rustling leaves, our group left with a heightened appreciation for nature and a clearer understanding of the island’s importance to the Native American culture. 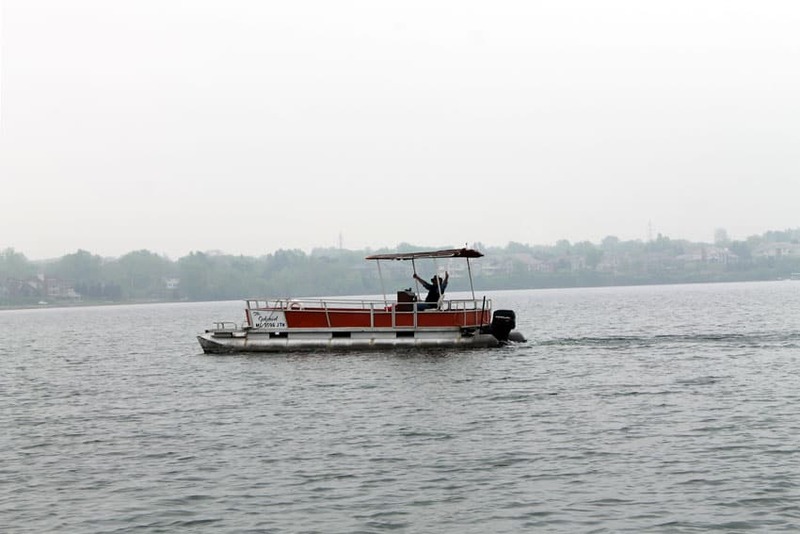 Today, Apple Island is owned by the West Bloomfield School District and is used primarily for ecological research, archaeological digs, field trips, and other educational purposes. 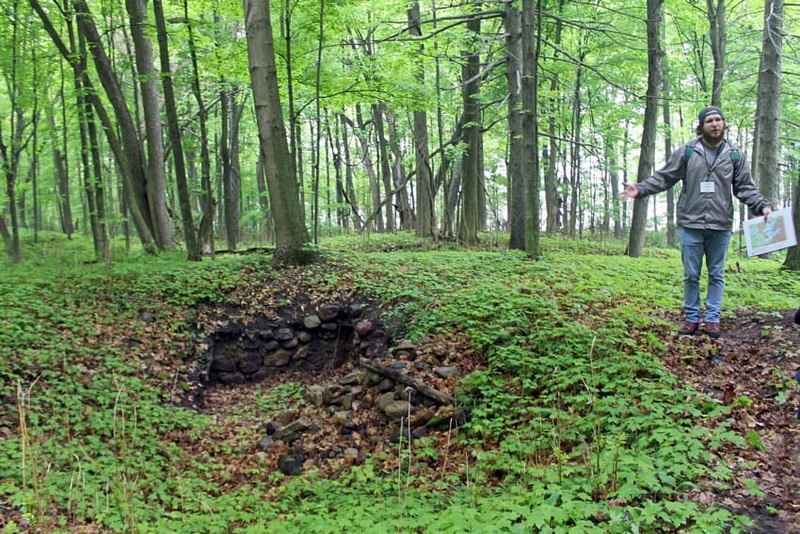 Although public tours are limited, the Greater West Bloomfield Historical Society (GWBHS) offers private group tours of the island and other events throughout the year, including home tours, nature walks, archaeology workshops, and more. Click here to learn more about the GWBHS and plan your next activity! Have you visited Apple Island? What other “secret” places in Michigan would you like to explore? Tagged apple island, greater west bloomfield historical society, lakes, native americans, orchard lake, orchard lake museum, Southeast Michigan, west bloomfield, West Bloomfield School District.